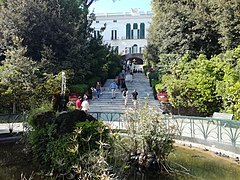 The Villa Floridiana is a large park in the Vomero quarter in Naples, southern Italy. It overlooks the western Neapolitan suburbs of Chiaia and Mergellina. The Villa Floridiana on the Vomero hill in Naples. The villa dates from 1816 when Ferdinand I of the House of Bourbon, King of the Two Sicilies, acquired the property. Between 1817 and 1819 the architect Antonio Niccolini reconstructed the building and the surrounding gardens. The director of the Botanical Gardens, Friedrich Dehnhardt, planted oaks, pines, palms, cypresses and a large selection of flowers in the gardens. The King then donated the property as the site for a vacation residence to his morganatic wife, Lucia Migliaccio Partanna, duchess of Floridia, from which the villa has taken its name. The neoclassical residence and surrounding gardens were built between 1817-19. The Villa currently houses the National Museum of Ceramics, Naples. ^ a b Legler, Rolf (1990). Der Golf von Neapel (in German). Cologne: DuMont Buchverlag. ISBN 3-7701-2254-2.